If your computer has ever suffered a computer virus or crashed unexpectedly, you may understand the importance of backing up your important computer data. For enterprise, it is not enough only to back up files and data. They have to consider other factors such as share and security. For personal, storage volume capacity is taken into account. So, backing up Windows computer to a network hard drive is becoming what many people want. 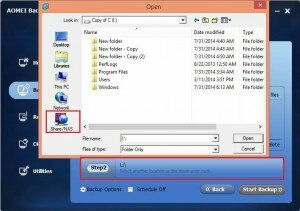 Why should you back up Windows computer to network hard drive? It can be more safe and convenient to check and read. You don’t spend much time and money to install external hard disk, and then copy data and files. You can save much time in the process to switch. For purpose to share. You can be easier to let others get our files and setting without storage device delivery. It benefits unified management. You can commit files and setting to server, and share it with others. Every staff could not prepare one or more external hard drive in same enterprise. 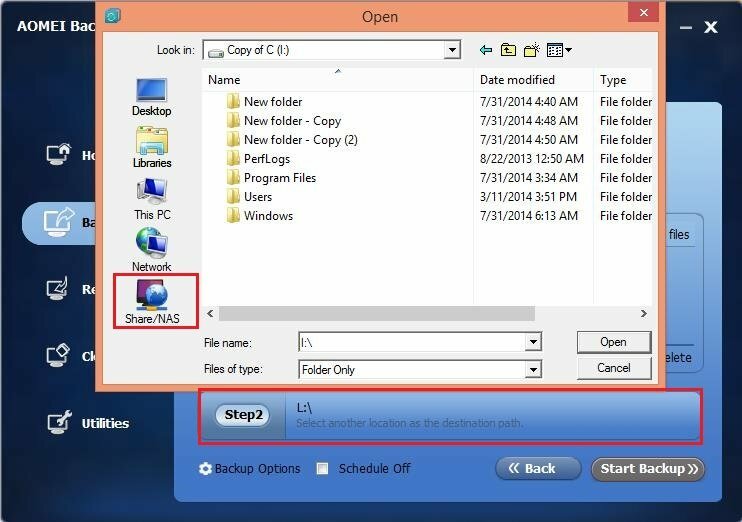 The principle to back up files and settings to another computer on the network is similar to pass something by instant messaging, but the things different are that backing up to another computer mainly rely on LAN, and if you use the third-party software such as AOMEI Backupper, the files and settings will be encoded by that software. If you want to read files and settings in another computer, you must install that software. It is safer to protect users’ privacy. You can back up our your files and settings with AOMEI backupper standard Edition, which is not only free charge, but also can back up your system to another computer. The instruction below can guide you to operate easily. Click “File backup” in the software interface. A pop-up window appears when you click share/ NAS. It requires you to input IP address, users’ name, and password of another computer where you will back up. When you finish the operation in the step above, the precess of backing up will be started. You will find it easy when you try it in person by AOMEI Backupper. In the whole process, you can’t nearly get into trouble. How to Convert Unallocated Space to Free Space?